There are – of course – more important things to discuss than my garden these days. My heart has been so heavy that it's hard to talk about normal life without it feeling shallow and without substance. So yes, at the moment I am working on a post of a different sort. One to help us open our hearts and our minds a bit, to seek understanding and connection in this difficult times. But that's a post I can't hurry. So we'll talk about garlic today instead and let it be a warm sliver of normalcy. Last fall Pete took the initiative to prep a brand new garlic bed. Our old garden was so thick with weeds (mostly thistle, bindweed, smartweed, and pigweed) that it was hard futile to try to keep on top of it. 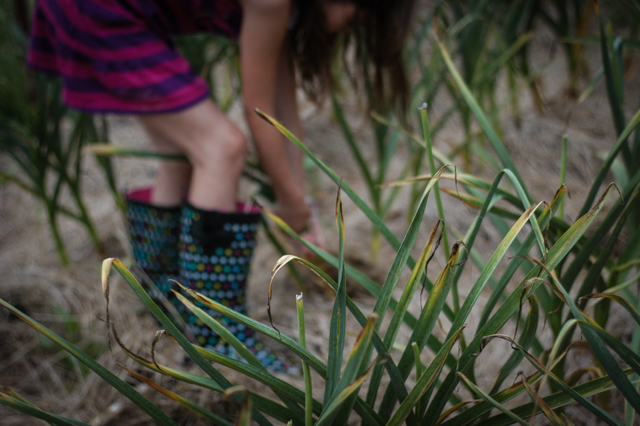 Last summer we literally crawled through weeds to harvest the garlic. It was ridiculous. But this year, with a new bed, some attentive weeding and deep mulch, Pete rocked out the garlic. Yesterday was harvest day and so we all set to work. For anyone who hates gardening I'd like to announce that harvesting a gorgeous crop from a well maintained bed is a pleasure. Who knew? We didn't even have to crawl. The heads pulled easily from the ground, there were zero weeds, and the satisfaction of that impressive mountain of garlic was like none other. So much garlic! Unlike last year almost every head survived. (All 350 heads to be exact.) Approximately 125 of those we will replant for next year, leaving 225 heads for canning, sriracha and pickle making, live ferments, and cooking with throughout the year. That's just over 4 heads per week, minus those we use for canning and food preservation. Have I mentioned that I didn't plant a garden this year? Despite having starts; despite all the seeds I bought. I planted a few rows, yes, but they were so quickly overtaken by the aforementioned weeds that I threw in the towel. It's knee- to shoulder-high carpet of thistle with some kale and spinach peeking out. It's true, ya'll. I'm a homesteading failure. We decided instead to pour our energy into a new location for our garden (one that is not directly on top of a thistle patch, perhaps) and prepping raised and hugel beds for next year. And now? Well as it turns out after pulling the garlic we have one gorgeous, weed-free, deep-mulched garden bed, just waiting to be planted. I think I'll take that challenge. Who knows – if I pull this off I might even get my homesteader's card back (at least on probation). Fall veggies here we come. “So much garlic!” Understatement of the year. That’s so much garlic, my heart almost stopped just looking at it. Absolutely phenomenal! What gorgeous garlic! Fall veggies are just as tasty as spring ones and I find the weeds don’t grow quite as tall as quickly as they do in a spring planted garden. Treasure! Enjoy all that tasty garlic. Curious what sort of mulch you recommend for veggie beds? It seems like so many options have significant drawbacks — it looks like you have found a winner, though! Many thanks. If you came to my farm you would see a large garden planted with potatoes, brassicas and asparagus. If you look closely you will see those plants but more apparent is the thistle and so much prairie trying to regain its position. I have given up. I will get what I get. on the other side of the house you will find 8 raised beds lovingly made by my husband with beautifully growining vegetables, all weed free. Like you, i have realized that you cant hold back the prairie from becoming a prairie again. We use straw for mulch. When the weeds are particularly out of hand we will also layer cardboard of paper feed backs to choke them out. Ah, yes. Keep me posted on how those raised beds work! That’s so much garlic, looks so healthy.